Home » Featured » The Starting Point for GREAT! Is there a simple way to help couples find a new Starting Point for a GREAT marriage? Absolutely. The key is to know — not just suspect or feel you know — exactly what you value most. So many people THINK they are clear on their Top 10 personal values, but when it comes down to the choices they make and the actions they take, they quickly realize that what they think is “set in concrete” is really pretty fuzzy at best. When you get right down to it, a happy, strong marriage that will last an eternity — or at least “until death do you part” — is 100% values based. Each partner has a strong sense of mutually significant, and complementary values. Because of this common, easily communicated sense of value, they tend to have common visions and expectations for how they want to live. They instinctively KNOW each other’s HOT buttons, and how to push them. No, not stirring them up to the point of ANGER — but to a RED HOT sense of passion and purpose — which drives each person to contribute even more than they would, or could, individually. Shared values leads directly to shared visions which provides the conviction each person needs to make important commitments without hesitation, equivocation or reservation. Shared values leads directly to clearly defined roles that each party embraces — enthusiastically! Getting absolutely CRYSTAL CLEAR on what you value most is the single biggest, and fastest and easiest thing you can do to take your marriage up from Average… to Good… to Great… to Exceptional. It will cause rapid movement up the Marriage Continuum because big values have the energy to ignite your spirit and fan the flames of passion into the power required to achieve your most cherished dreams — much sooner than you ever dreamed possible. You cannot build a GREAT Marriage until you triangulate your direction over time. Lacking direction, you float on the sea of Mediocrity, bobbing where ever the waves take you. Crystal clear values provide the context for every decision you make and every action you take. The difference between a couple who have clearly articulated their values and a couple who is aimlessly drifting along is stunning. For example, a couple who has worked out their Top 10 values might array them in this order: Freedom… Adventure… Compassion… Physical Challenge… Camaraderie… Giving… Spirituality… Integrity… Financial Abundance… and Education. They might dream of exotic trips where they challenge their senses with adventure, cliff-climbing, volunteering deep in a jungle and worshiping together on the Serengeti plains at a mission outpost of the Baptist Church. They would be motivated to save money and secure their financial future. They would give of their time and talents in a window of high adventure. They would never make decisions that would compromise their freedom or integrity. Because they highly value education, they would make sure every person in their family has every opportunity to learn… and if desired… get a formal education. They know who they are, individually and as a couple. They know that each has the others best interest at heart, because they have such a strong bond of shared values. They are living THEIR life, not somebody else’s life, or a life that has been IMPOSED on them. They have the ENERGY to dance their dreams into their life. Why? Because they actually have a real list of their most important values… know precisely what those values MEAN to each party to the marriage… and have created an entire series of shared visions that will deliver the life of their dreams. They have earned the RIGHT to EXPECT their visions will be realized, because they have fully ENERGIZED each of their values. A couple who has not worked out their Shared Values has no common point of reference, so their dreams are scattered, disjointed and fractured. In fact, they have no clear idea who’s life they are actually living. They have been told that they must value family… but are clueless as to what that really means, and specifically what to DO about it. They have been told that they must value faith… but do not see the connection between their faith, their marriage and their life in general. They have been told that they must value safety and security… but feel like all that security is boxing them in. Lacking crystal clear Values, enunciated in prioritized order, they are usually confused, conflicted and uncommitted — and dream about getting through the week, living payday to payday with few goals driving the excitement of the future. A lack of shared Values leads to a lack of ENERGY and EXCITEMENT. If you don’t really KNOW what you value more than something else, you will spend the ONLY life you have to live on things that lack meaning and importance. You spend your days chasing after this, that and everything else… hoping to find some meaning and significance in your life. You merely EXIST not LIVE. 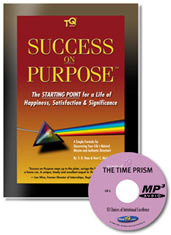 If you are looking to create a powerful sense of shared values… an unstoppable sense of vision… and an unbreakable commitment to your future, do the exercise in Success On Purpose: The Starting Point for a Life of Happiness, Satisfaction and Significance. The idea is to triangulate your Values, Visions and Roles into your Natural Mission and Authentic Direction. The simple truth is that these variables are the key to moving your marriage up the continuum from merely Average… to GREAT… fast! We challenge you to start LIVING on a whole new level… and do it on purpose. We challenge you to take your MARRIAGE up to a new level of happiness… a new level of meaning… and a new level of personal and marital achievement. Over the last 17 years, we have heard from thousands of our customers who have completed the exercises in Success On Purpose. Their resounding endorsements were that this program was, quite literally, the answer to their prayers. If you have been praying for an ANSWER to the life-changing questions you face… praying for financial FREEDOM… praying for the VISION necessary to take your marriage up to the next level… Success On Purpose may be the answer to your prayers. You may choose from various configurations, bundles and system packages from $29.95 to $129.95. Group discounts available. As always, your satisfaction is unconditionally guaranteed.